Released by the Navy in 2008 to replace the 1990 versions of Vol 1 & 2. 398 pages, 3-ring binder. This volume focuses on strandings and provides expanded material on the application of naval architecture to marine salvage. The naval architecture chapters are background for all the volumes. An understanding of salvage naval architecture is vital to salvors’ understanding of how a ship will respond in situations for each she was not designed. All calculations are presented so they may be made by salvors in the classroom or in the field with only a hand-held calculator. This volume also focuses on the salvage of sunken ships, and in a broader sense, harbor clearance, where actual ship salvage is secondary to obstacle or wreck removal. 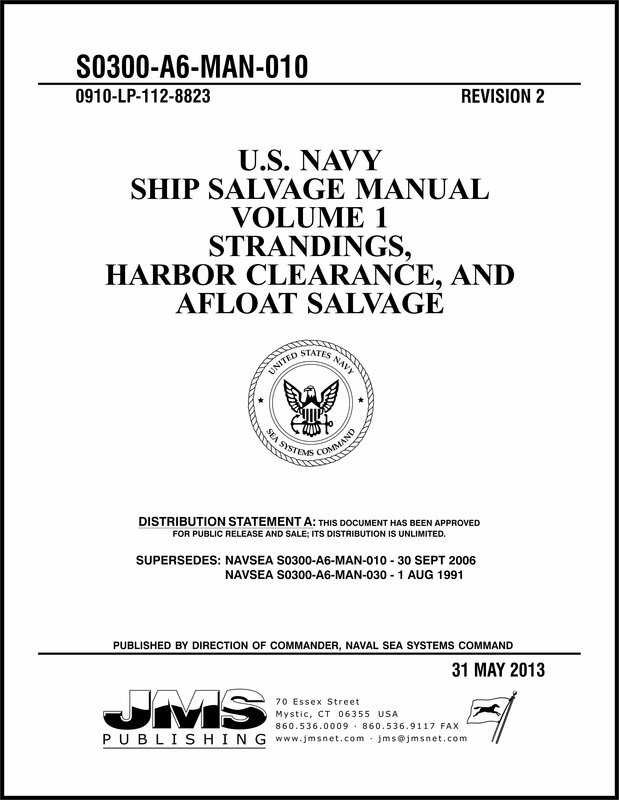 It presents practical information to the Navy salvor conducting sunken ship salvage or harbor clearance operations, and incorporates specific techniques previously employed to solve real problems associated with actual wreck removal operations. Organizational relationships, both external to and within the Navy, are defined to assist the salvor in planning during major salvage operations in periods of hostilities or in the wake of natural disasters. Appendices containing technical information about U.S. Navy salvage equipment, commercial equivalents of many standard stock items, innovative tools, and environmental effect of extreme cold weather operations have also been included for ready reference to the Navy Salvor.